When you delve into FW mechanics you will notice that Faction War, as we know and love it, is really the 'dumping together' of three distinct mechanics. 1st, you have missioning. Currently, missioning only rarely inspires pvp and is the main (and almost exclusive) way you can make ISK in FW. 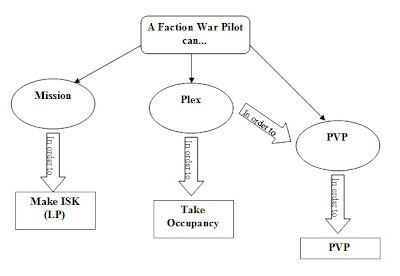 3rd, you have plexing which is currently directly related to taking occupancy of a faction's system. This seems somewhat limited to me, and part of my goal in coming up with an idea for FW was to increase the number of choices pilots have. Telling a pilot he must do 'this' or 'that' to achieve a specific goal seems very un-sandboxy to me. Several parts of my suggestion addressed this. making more things affect occupancy gives players more options. 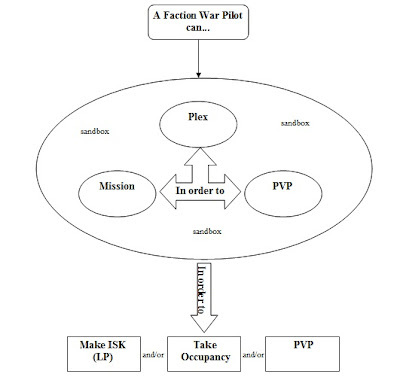 This also correlates to the logical 'storyline' aspect of Factional Warfare, where any pvp engagements should affect the war somehow. In general, it increases the immersion factor of Faction War. giving LP for plexing and pvp while increasing the risk to mission running will balance some of the risk vs reward, and encourage more people to engage in different activities. 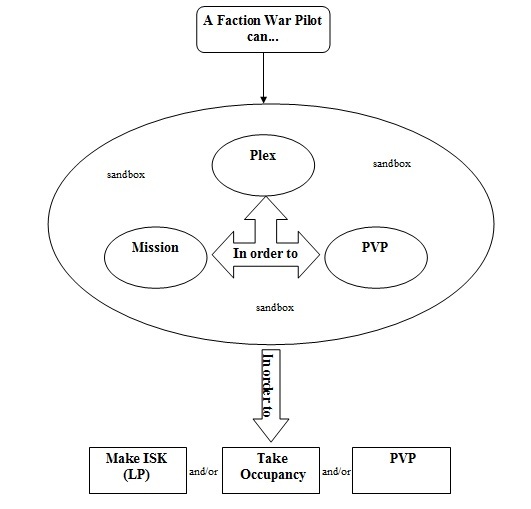 Just like you have many opportunities to make isk in other aspects of EVE (nullsec pilots gain systems to access to better ore for mining, better exploration sites, ratting, etc) you should also have options in Faction War for making ISK in relation to the game mechanic. 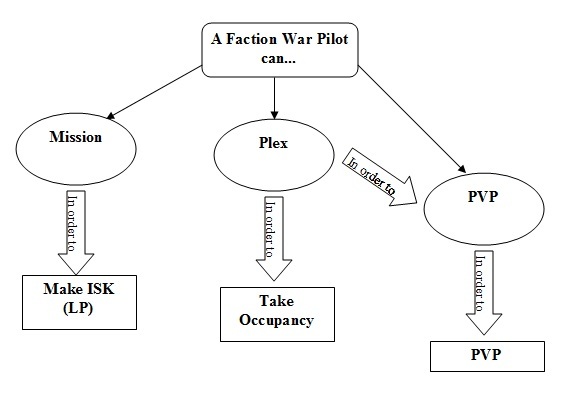 In many ways, the bottom arrow on the last graph could be drawn to point both directions: with this structure, players could plex to make isk to fund pvp, or pvp to take occupancy to gain access to missions....etc. The point being, you would have a lot of options for gameplay. Who knows all the ways that players would go? And that's the point. Does a wormhole have the Pve,Pvp,War(free 0,0 style pvp) in it? Burgers: Yes. ALL wormholes are -1.0 truesec (aka "true nullsec"). In my "dream EVE" -- NO part of the game is "static". It's always fluid, always subject to change based upon the players and their actions and interactions. That's one of my biggest gripes about hi and lowsec ... in the end, nothing you do really changes anything, your actions or inactions have ZERO impact on the overall game world. For a game that touts itself as "the players are the story," that's really not a good thing, and kinda leads to feelings of false advertisement. At least from my POV. Now, if a fleet in lowsec could say, pop station guns and shoot services... sure it would be "structure grinding", but at least you could DO something to directly affect the "other side" in a very concrete and meaningful way, or hell even neutrals (blast a "civilian" station's popular L4 missioning to oblivion, for example)... I think that'd be great, what about you? I think modifying missions to require ships that cannot just speed through or use a cloaky bomber would encourage more PvP. The reason FW mission sites are visible to everyone is to encourage PvP. It would be cool if a) You had to run FW mission in a ship that could actually be caught; b) if you defended a mission site from the missioner it would give YOU equivalent LP from the opposite side, and c) as you state, it would contribute to occupancy.